This 5.5-mile trail takes hikers along a very scenic and unique stretch of ridge line between the twin summit peak of Silver Star Mountain. Silver Star is an exposed, twin-summitted mountain in Southwest Washington's Skamania County. In 1902, the Yacolt Burn cleared the mountain, leaving open meadows to be repopulated with summer wildflowers. Though not far from Portland as the crow flies, the drive to the trailhead is not short or easy. The last several miles of driving are done over confusing, single lane, pothole-laden roads. Hikers driving low clearance vehicles will be able to make it, but it will be slow going. Even those with high clearance vehicles should exercise caution. The route described here is the most direct and the best for viewing beautiful wildflowers. It is only 5.6-miles round trip to the summit, but is steep in some places as you gain 1240 feet in elevation. You will start in a maple forest and then take an old access road for most of the way up. Once you are close to and can see the true summit, you will reach an unmarked junction and will go to the left. There is old lookout tower on the summit, which makes a really good break or lunch spot. It is also a great spot to set up the camera and take a picture of the group! There may be several options to the summit of Silver Star, but Ed's Trail is without a doubt the most scenic and unique. Climbing Silver Star from the north, Ed's Trail stays just below the ridge crest as it leads through scenic meadows and around rocky outcrops. You will pass several trail junctions, but should simply continue straight on the main trail. The trail takes hikers through a natural rock arch and briefly into a shaded forest before the final climb to the summit. 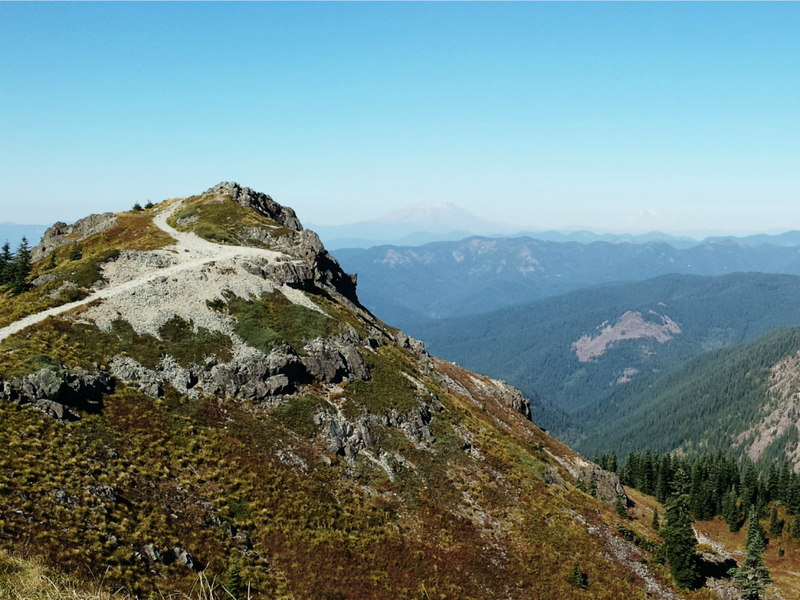 The view from the top is stunning – affording a 360 degree panorama that encompasses the Gorge and many prominent Cascade peaks, including Rainier, St. Helens, Adams, Hood, and Jefferson. What makes Silver Star truly memorable, however, is that it boasts arguably the best wildflower show in the area, which is on display from mid-June through August. Throughout the hike, while you are surrounded by wildflowers, you will pass impressive rock outcrops that add a lot of interesting depth and character to hike. For food and drink try Jo Brown's Cafe in downtown Vancouver, Washington. It is a sweet little greasy spoon just off of I-5 on the way to the hike. We're talking house-made sausage and omelets big enough for two. This hike is acceptable for hikers at many experience levels because of its brevity. It is steep in some places, as you are hiking to a summit, but even less experienced hikers can get to the top, though it may take a couple of breaks to catch your breath. For an experienced hiker, this hike is a short day to an incredible view at the top. The trail described here is Trail #180, nicknamed “Ed’s Trail,” but signed as Silver Star Trail #180 at the trailhead. From Portland, take I-205 N to WA-500 E, which is exit 3, then continue to WA-503 N and stay on that for about 12.5 miles. Take a right onto NE Rock Creek Rd, which is signed for Lucia Falls and Moulton Falls. Eventually this road will turn into Lucia Falls Road. At mile 8.6, turn right on Sunset Falls Road, which is signed as Sunset C. G. After 7.7 miles, turn right on Road 41, which goes through Sunset Campground, over a river, then goes left. After 3.4 miles, turn right on Road 4109 and continue for about 1.3 miles until you reach an unmarked 4-way junction and go to the left. You will finally reach the trailhead after 2.9 miles.